"Day of the Dollmaker" - Part One: "Toying with Emotions"
Cat Grant and Kara go to see Toyman in Arkham about some children who went missing in Metropolis. Cat brings out a Supergirl doll she was sent back in Supergirl #38, which arrived the same day one of the kids went missing. She then received two other robotic dolls on the days two other children went missing. As Toyman examines one of the robotic dolls, it recognizes his voice, activates and stabs him. They take him to the hospital and try to figure out who sent the dolls to Cat, and Cat reveals she got Supergirl to help her by almost blackmailing Lana over her relationship with Supergirl (and only because she couldn't get a hold of Superman). Fed up with Cat's incessant griping, Kara leaves to go look for clues in Metropolis. As Kara fights Riot she talks to Lana, who explains Cat's backstory with Toyman from waaaaay back in the 90s, and how her son Adam died at the hands of one of Toyman's robots, and that's what changed her into the angry woman she's become. Cat goes to visit Adam's grave, and one of the toy robots is watching her. When she gets home her door is open and she's attacked by another one of them, which she tases and puts down only to discover it was one of the missing children in disguise. And that's when she meets ANTON Schott, who calls himself "the dollmaker". At STAR Labs, Lois goes to visit Lucy who is being restrained. Lois wants to talk, and Lucy's eyes glow red. Story - 5: Yes. YES YES YES to everything in this issue. It's full of character and heart, it's full of continuity... bringing up the death of Adam, one of the most moving Superman stories of the 90s? Using that to explain Cat's character changes? Genius. A reference to Lana's son Clark, and her strained relationship with Pete Ross? Fabulous! The way Cat keeps picking at Kara in the hospital, and Kara standing up for herself and leaving to do things her own way? Excellent! Even the recapping of the old, old, old continuity (yay!) was done in a very natural, conversational way... the exact way it SHOULD be done, so it doesn't feel forced or like it's there simply to remind the readers (or inform them, as I imagine many new readers have no idea about that story from a decade and a half ago). 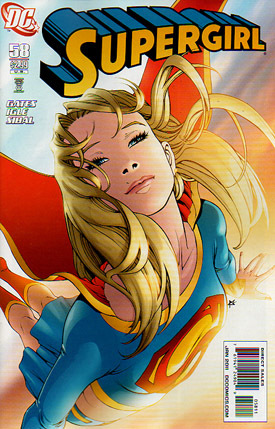 THIS is what a Supergirl comic should be. Brilliant. Art - 4: It's nice to have Igle and Sibal back after their break. Sometimes you don't realize how much you'd miss something until it's gone. 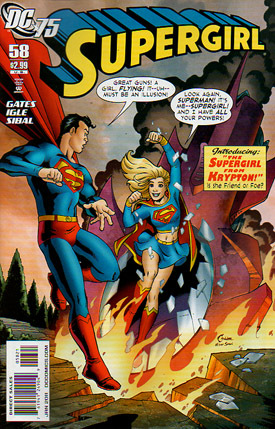 Cover Art - 5: Yes it's just a generic Supergirl image, and yes her pose might break the back of even the most nimble of acrobats, but... That is one damned fine image. I could stare at it for hours. Simply beautiful. Cover Art (Variant Cover) - 3: Well, um... I get that it's a modern update of the cover with her first appearance, but what I don't get is *why* this is an alternate cover for issue 58? Did I miss something? I'm really confused.